Figure 1. 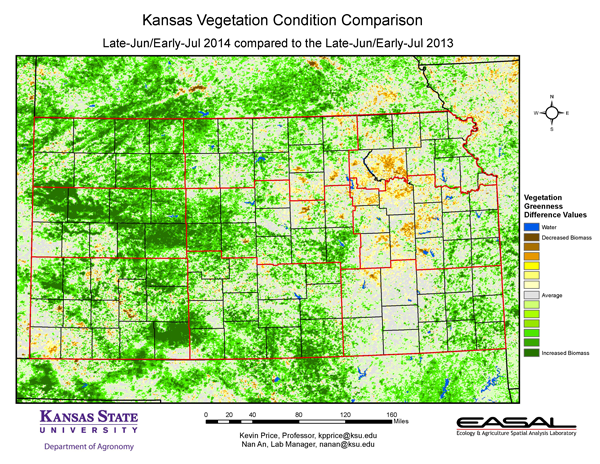 The Vegetation Condition Report for Kansas for June 24 – July 7 from K-State’s Ecology and Agriculture Spatial Analysis Laboratory shows that the area of highest productivity is in the eastern third of the state. Increased photosynthetic activity can also be seen in parts of southwest Kansas where high rainfalls have been reported. Figure 2. 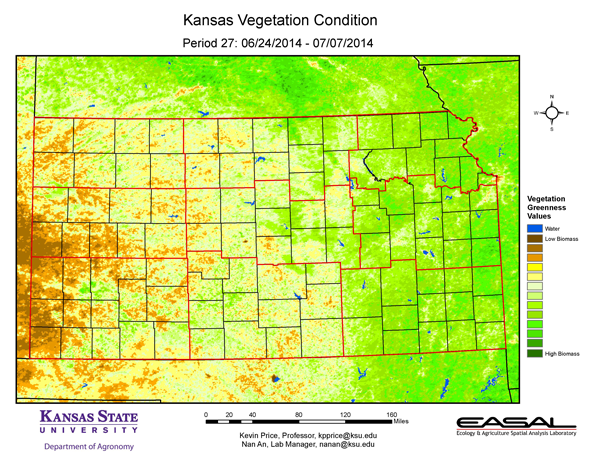 Compared to the previous year at this time for Kansas, the current Vegetation Condition Report for June 24 – July 7 from K-State’s Ecology and Agriculture Spatial Analysis Laboratory shows that statewide biomass production is higher. This is particularly notable in the Smoky River Valley. Figure 3. 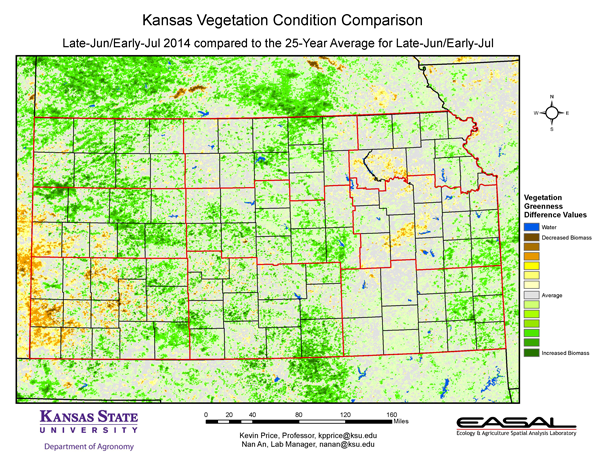 Compared to the 25-year average at this time for Kansas, this year’s Vegetation Condition Report for June 24 – July 7 from K-State’s Ecology and Agriculture Spatial Analysis Laboratory shows that most of the state is close to average. Areas of extreme southwest Kansas, which have continued to miss out on the rain, continue to lag in biomass production. Figure 4. 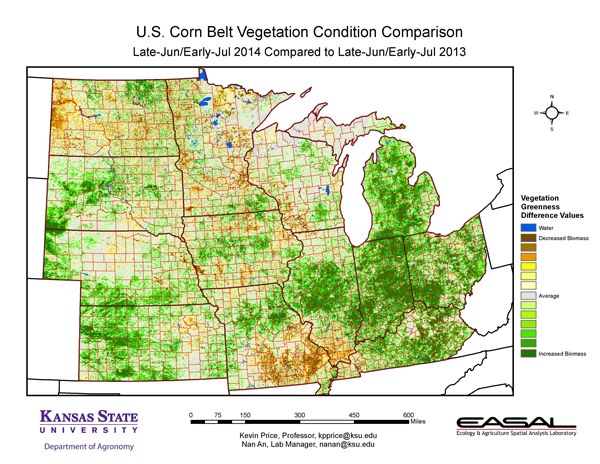 The Vegetation Condition Report for the Corn Belt for June 24 – July 7 from K-State’s Ecology and Agriculture Spatial Analysis Laboratory shows that high biomass production dominates the Corn Belt. 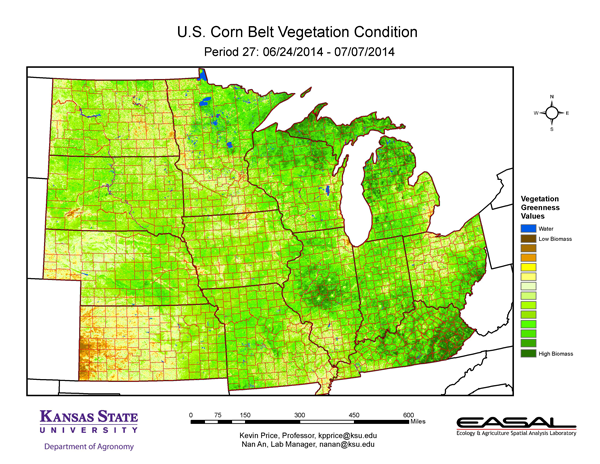 Most of western Kansas continues to stand out with lower NDVI values. This reflects the continued extreme drought in that area. Figure 5. The comparison to last year in the Corn Belt for the period June 24 – July 7 from K-State’s Ecology and Agriculture Spatial Analysis Laboratory shows that the greatest departures can be seen in southeastern Missouri. Figure 6. 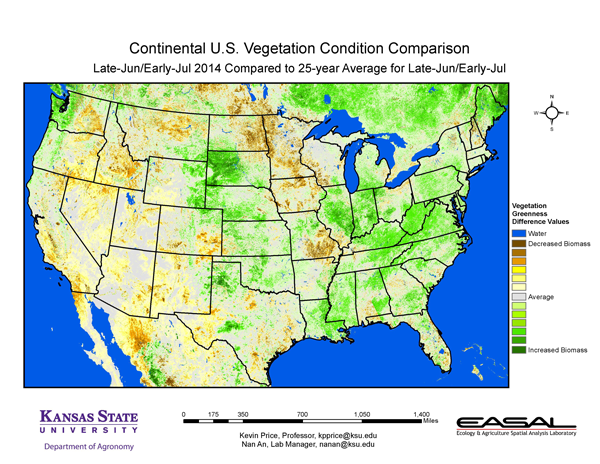 Compared to the 25-year average at this time for the Corn Belt, this year’s Vegetation Condition Report for June 24 – July 7 from K-State’s Ecology and Agriculture Spatial Analysis Laboratory shows that the central portion of the region has the biggest decrease in productivity. Excessive moisture has been an issue in this region. Figure 7. 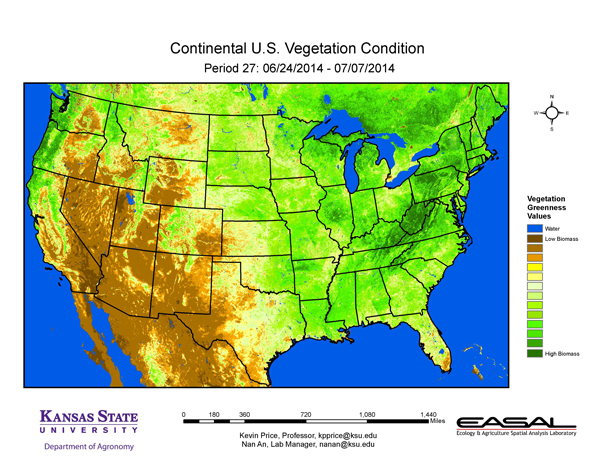 The Vegetation Condition Report for the U.S. for June 24 – July 7 from K-State’s Ecology and Agriculture Spatial Analysis Laboratory shows that the highest NDVI values are centered on West Virginia. Southeastern Colorado and southwest Kansas, where drought continues, have lower values. Figure 8. 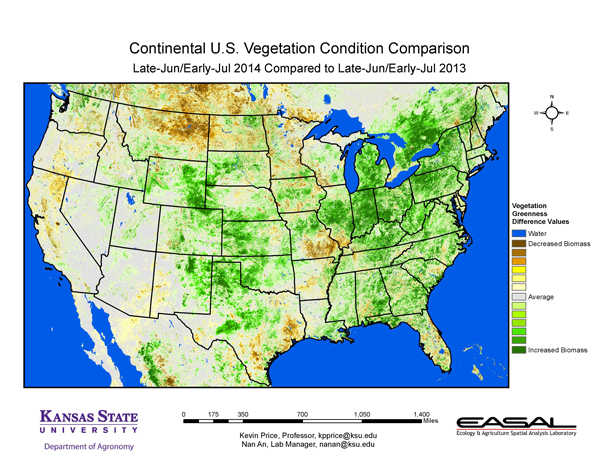 The U.S. comparison to last year at this time for the period June 24 – July 7 from K-State’s Ecology and Agriculture Spatial Analysis Laboratory shows that much of the country has an increased level of biomass production. Notable are the areas of decreased production in southeastern Missouri and in northern California. Figure 9. 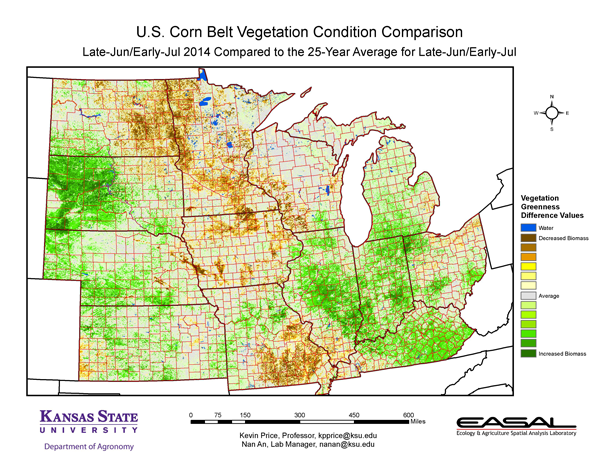 The U.S. comparison to the 25-year average for the period June 24 – July 7 from K-State’s Ecology and Agriculture Spatial Analysis Laboratory shows that the Central Plains has above-average biomass production. There are noticeable areas of below-normal productivity to the east and west. To the east excessive moisture has created problems, while extended drought continues to depress production in southeastern Colorado into New Mexico and Arizona.